Readit Touch is the World's most sophisticated desktop auto-reader available. Use it as a normal desktop CCTV with closeup and distance viewing and enhanced two colour modes. Then simply switch to capture mode to photograph your documents up to A3 (tabloid newspaper or double Letter) in size to have them automatically scrolled and read back out loud. Minimise the Readit application and you have access to a fully functional and very powerful desktop PC system! What are Readit Touch's benefits? Users Read Faster: This is Readit Touch's main benefit. With digital capture up to A3 (or double Letter), OCR of close up objects and speech output, users can read over twice as fast as traditional units for longer periods with less strain so they can focus on the meaning of the documents, rather than struggling to read them. 10 megapixel images: Readit Touch's image resolution is over 3x that of the nearest alternative product for closeup capture. This means you get superbly sharp images for OCR and unparalleled accuracy. No X/Y table required: Even for large documents and books, Readit Touch's virtual X/Y table with word wrapping means once you've captured a document, you'll never again accidentally miss a line when reading. Storage / Export: Entire books can be stored and retrieved with the press of a button! Even export them to MS Word for editing! It is your PC: Inside every Readit Touch is a high performance Intel PC which is fully accessible. 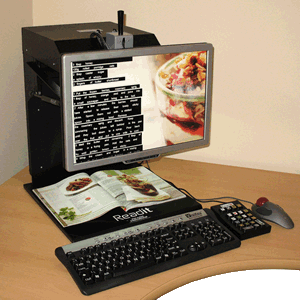 Therefore Readit Touch is your PC and digital capture system, all-in-one! Who is Readit Touch for? Readit Touch is the perfect all in one desktop reading solution for business and home users. It fits perfectly in institutions as a single point access technology solution. Simply load your preferred screen reading software onto Readit Touch and you have everything you need to make your documents accessilbe, in one machine.